Another calendar year gone and six more months toward 9 years of The Oddness of Moving Things. 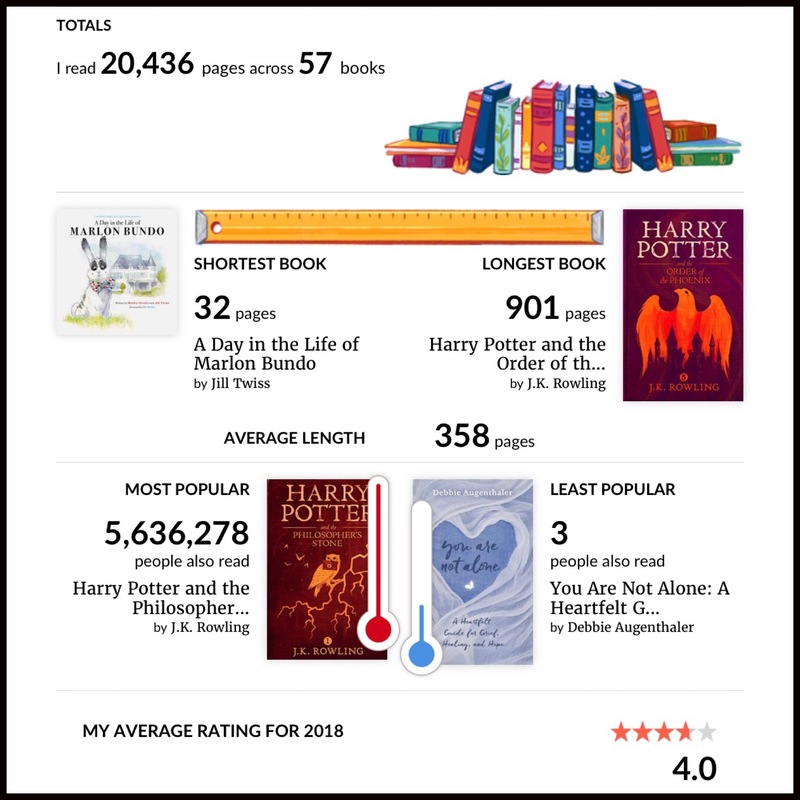 Now that my last books of 2018 have posted I’m ready to share my stats for the year. It was yet another crazy busy year in my personal life and I’m not sure it will ever slow down again. After taking some time off and starting a new job at the very end of December that has a lot of long term viability I’m hoping at least my professional life will stabilize, allowing me to READ MORE BOOKS! Now on to the numbers. 2018 was a mediocre year when it came to reading for me. 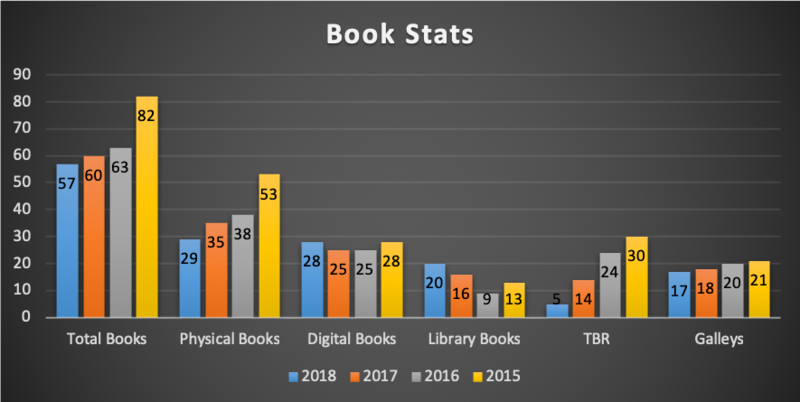 It followed the downward trend of the past few years and actually matched my lowest number of books read going back to 2011 (not counting the first half year in 2010). That being said I read some great books this year and I’m looking forward to 2019. 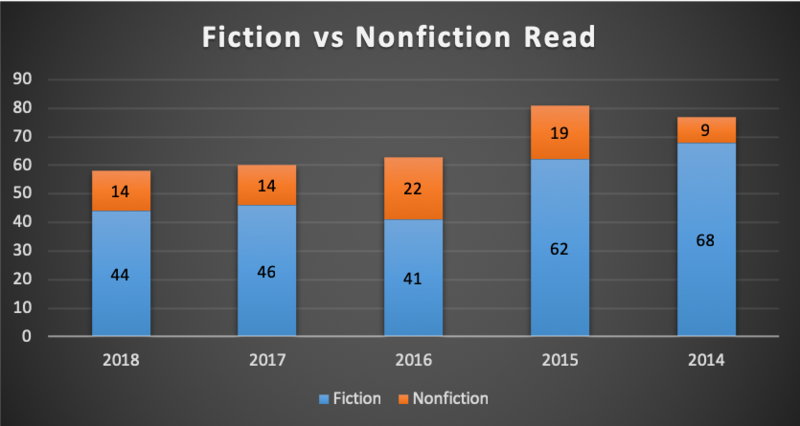 The three biggest highlights were 33 of the authors I read in 2018 were new to me; 68% of the books I read were by female authors or had female contributors; and I just squeaked by my nonfiction goal of at least one nonfiction book per month with 13. The most disappointing fact was the lack of translated works at 0. I’ll need to work on that in the future. Again, similar to last year, I’ve kept the explanations to a minimum – I think they’re pretty self explanatory. See that downward trend 😦 Life happens, but I stayed between my stated goal of 60 and my personal goal of 52. I need to work on my TBR list though—I have too many books on my shelf to have only read 5 last year! I read fewer books but more pages this year. 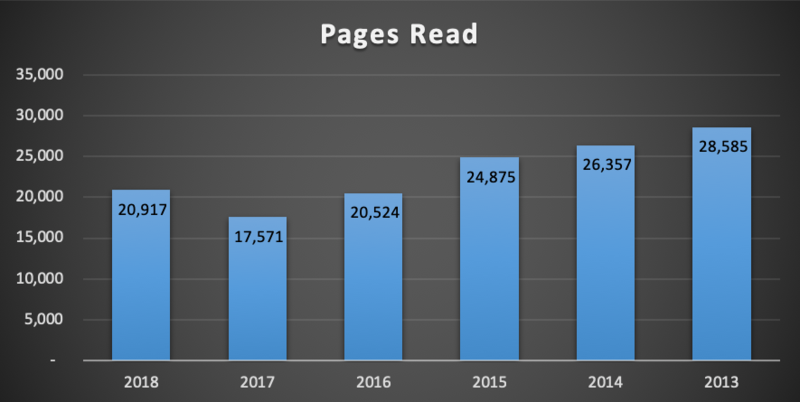 I’m guessing the average page length was significantly higher to have read more this year than in 2017 (60 books) and 2016 (63 books). 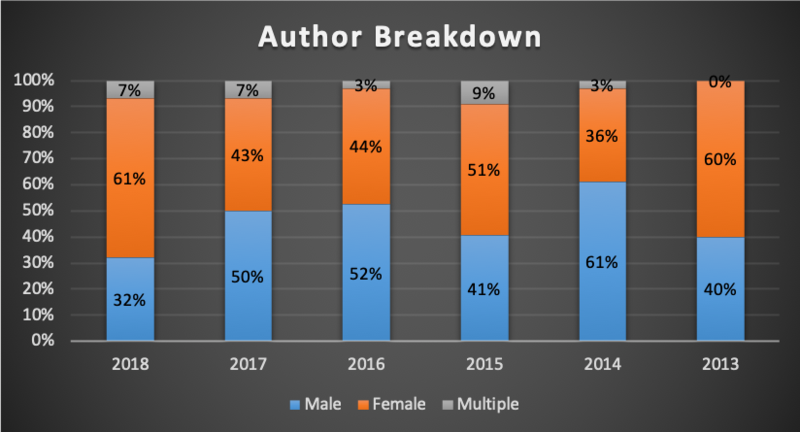 Author breakdown shifted back to more female authors then male. I’m working on an overall average since I began tracking and will hopefully have that chart for 2019. As I said above, I really only try to read at least one nonfiction book a month. I squeaked by this year with 13 nonfiction and 1 blended. I’ll need to add blended as a category next year as I’ve usually just lumped them into both making my numbers a little funny. I’m glad to see I’ve been just as picky about accepting unsolicited galleys as I have in the past. I’m working on a new version of this for next year even though this is a new version. I’m debating adding self-published metrics. 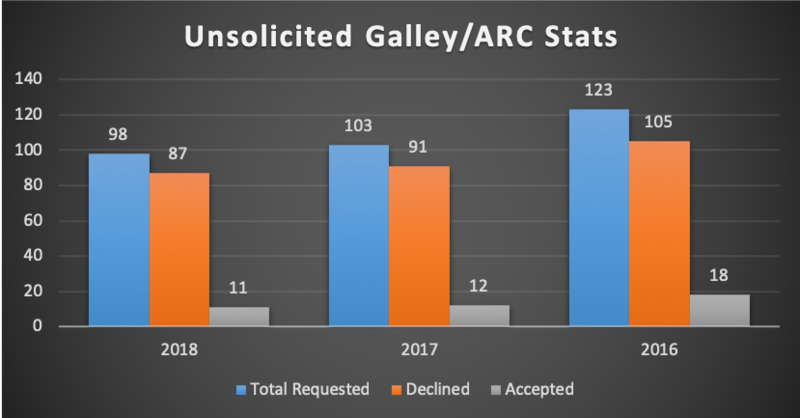 What this doesn’t show is the 6 additional ARC/galleys that I requested from publishers 😀 Of the 98 unsolicited requests, 38 of them were self-published and I only accepted one of those from a publicist (Quietus). Unfortunately, I did not like it mostly due to the setting being Boston and it not feeling authentic. What was surprising about this one was how far I had to go down my book post to find those published in this year. I’ve included the overall ranking in parentheses. I was not impressed with the number on here that I did not enjoy including #1, #5, #6, #7, and the first of #9, but I guess that means I at least got my thoughts out to people to caution them. I debated changing my goal of 60 on Goodreads, but decided not to as it’s a stretch goal the past few years. I read 13 nonfiction books last year, one more than my goal of one-a-month, but I’d like to increase that a little more, maybe 25-33% of my reading, but I’ll leave it at more for now. This could be a stretch. I’m sitting at 908 (four in the queue). If I read 52 books and post 12 recaps in that puts me at 972. Redesign at least one book page. I learned how to do float images this past year and I want to try a book cover layout on at least one page. Find new book bloggers and interact with them. I haven’t done a clean up recently of my RSS feed, but I’m sure it’s sad who isn’t blogging anymore. Plus, you can always use new book blogger friends! SUPER STRETCH GOAL: Transition to a self hosted website. I’m about 75% confident I can do it on my own, but I just need to set the time aside to do it. Did you have any surprises in 2018? What are your goals in 2019? You still beat my piddly book count! 🙂 Sounds like it was still a solid year. Happy to hear the job situation is looking up! Good goals for 2019! I like setting once per month reading goals, they’re so much easier to keep track of. Last year it was 12 audiobooks, this year it’s 12 professional development books. Good luck on your goals! That is what I mean and absolutely! I may not get to it in a timely manner, but probably will this year since I can’t have another 0 year! I won’t hold it against you even if you never get to it! War and Turpentine by Stefan Hertmans, translated (from Dutch) by David McKay. I read it last year and rarely read translated works, so that’s why your comment jumped out at me. I honestly had never thought much about the art of translation before reading it. Of course, being in the middle of trying to learn some Dutch and knowing how structurally different it can be from English added to my fascination with the process. The translator has some interesting writings online about his process. Hertmans is Flemish, from Ghent, and much of the book is set in Ghent, so I had an obviously biased interest in it. I won’t give too much away, there are plenty of reviews online, and you know better than I do where to find any info about it that you might want to check out before deciding if you want to give it a read or not. I’d really enjoy reading your review of it if you do! Oh I’ll have to check it out. Good luck with your reading, goals and new job in 2019! My goals for this year are to continue to make more time for re-reading old favourites, as well as reading more new-to-me books by my favourite authors. I would also like to get fully back into The Classics Club with my second list. Thanks! And I’m so jealous of your second list for CC! I made it to 51/100 and then basically went off on other quests. I will read those other 44 (and re-read 5) at some point in the future.